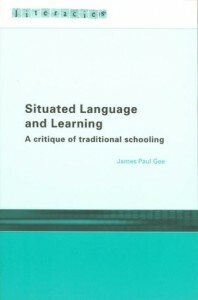 James Paul Gee addresses the tension between traditional academic language and new forms of literacy that dominate a high-tech world. In the not too distant past people who had made peace with school-based academic jargon and ways with words could be pretty much assured, all things being equal, of success in modern developed countries. But the times they are a-changing and things are more problematic now. Today, to hedge your bets, you probably want to make some sort of peace with academic learning—with school based learning. But there are new ways with words, and new ways of learning afoot in the world—ways not necessarily connected to academics and schools. These ways are, in their own fashion, just as special, technical, and complex as academic and school ways. But they are motivating for many people for whom school wasn’t. At the same time, they may be alienating for many people for whom school ways were motivating. These new ways, though, are just as important—maybe more important—for success in the modern world as school ways. These new ways are the ways with words (and their concomitant ways of thinking) connected to contemporary digital technologies and the myriad of popular and specialist practices to which they have given rise. We face, then, a new challenge: how to get all children—rich and poor—to be successful in school, but to ensure also that all children—rich and poor—are able to learn, think, and act in new ways fit for our new high-tech global world. We have barely begun on the first task only to have the second become more pressing by the day … . Academic language, aligned with “modern consciousness,” today represents a family of “old literacies” (the various school-based and disciplinary practices that recruit some variety of oral and written academic language—and it’s fair to use the term “literacy” here, since oral forms of academic language are different from, but related to, their written forms). They have been around now for some time. We have, for some time now, used them as our litmus test of school success. However, I would argue that academic language, and its attendant modern consciousness, once thought to be central to what counted as a “schooled” and “intelligent” person, is now at best a necessary, but not sufficient condition for success in society. … Failing to acquire academic language may still bar poor and minority children from power in society, but acquiring academic language (and showing affiliation with school and school-based practices and values) is now at least joined by other important centers of action. [T]hanks to modern technology, young people today are often exposed outside of school to processes of learning that are deeper and richer than the forms of learning to which they are exposed in schools. … I have been investigating the principles of learning that are built into video and computer games. Taking modern first- and third-person shooter games as an example (e.g. Half-Life, Metal Gear Solid, Deus Ex, System Shock 2), here are just a few (there are many more) of the learning principles that the player is (however tacitly) exposed to in learning to play these games. Learning is based on situated practice; there are lowered consequences for failure and taking risks (you’ve saved the game and can start over); learning is a form of extended engagement of self as an extension of an identity to which a player is committed; the learner can customize the game to suit his or her style of learning; the learning domain (e.g. a training module connected to the game) is a simplified subdomain of the real game; problems are ordered so that the first ones to be solved in the game lead to fruitful generalizations about how to solve more complex problems later; explicit information/instruction is given “on demand” and “just in time” in the game world; there are multiple routes to solving a problem; there are intrinsic rewards (within the game) keyed to any player’s level of expertise; the game operates at the outer edge of one’s “regime of competence” (always doable with the resources you have at that point, never too easy); “basic skills” are not separated from higher-order skills—both are picked up bottom-up by playing the game or several different games of a given type or genre; the meaning of texts and symbols is situated in what one does, and is thus never purely verbal or textual; meaning/knowledge is built up through various modalities (images, texts, symbols, interactions, abstract design, sound etc); meaning/knowledge is distributed between the player’s mind, the objects and environments in the game world, and other players (who help); knowledge is dispersed as players go online to get help and discuss strategy; players use affinity spaces dedicated to a particular game or type of game for learning; the game constitutes a complex designed system and the player orients his or her learning to issues of design and the understanding of complex systems. I could go on, but the point I hope is clear: imagine young people who have been immersed in this sort of learning coming to school to acquire academic language top-down in a setting remote from practice or affinity groups. Such young people experience much better viewpoints on learning in their “trivial” (from a Baby Boomer’s perspective) cultural pursuits than they do in the schools Baby Boomers largely control.